For the last six years, shell duck, a common migratory bird, had ceased to make its annual guest appearance in the wetlands of Kashmir. This season, bird watchers are jubilant at its return, along with a host of other winged visitors for a customary halt. And all as a result of cleaning up just some patches of these vital water bodies. Touted as "paradise on earth", Kashmir is known for its wealth of natural beauty, with its wetlands playing a vital role. But widespread encroachment and cultivation on these water bodies have severely disturbed the delicate water balance accorded by them. And this was immediately visible in the dip in the number of migratory birds arriving in the state. However, recent efforts by the state government and wildlife authorities to clean up small patches of the wetlands have yielded unbelievable results. And the birds are flocking back. But the question now facing the authorities is how to restore these life-giving water bodies while ensuring the sustainable livelihood of the people who would have to be evicted from there. Some of the birds, which have flown into Kashmir this year, include ruddy shellduck, common shellduck, greyleg goose, coot, gadwall, visions, mallard, pintail, common teal, common pochard, white-eyed pochard, and tufted duck. The arrival of around 300,000 avian tourists this year has surpassed the previous records and their number is expected to go up in the coming days. Hokara wetland, situated on the outskirts of the state capital Srinagar, has the maximum concentration of these birds from China, Siberia, north Europe and central Asia. Most birds visiting various parts of the country enjoy a brief stopover in Kashmir. 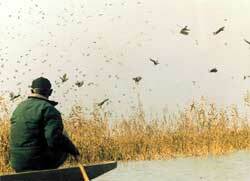 "In a way, Kashmir forms a launching pad for the migratory birds," ornithologists say. Better conditions and secure environment in the wetlands are said to be responsible for attracting the migratory birds. According to regional wildlife warden (north circle), Mohammed Shafi Bacha, "Government has provided additional grant to the wildlife department for maintaining the wetlands in Kashmir this year. Last year, the government had earmarked Rs two million only as capital component for the entire wildlife department. But this year the capital was increased to Rs 16 million of which Rs three million was set aside for maintenance of wetlands across the state. Nearly Rs 1.5 million was allocated for the maintenance of Hokara wetland alone. The free flow of funds enabled us to upkeep the wetland in a better manner." Welcoming this move, Bacha says improving the habitat would go a long way in conserving water and also the entire eco system. As of now, the cleaning up process has just started, he says. "For instance, in Hokara wetland, the wild grass had reduced the water quantity. We have removed the grass and created space so that water freely flows in the wetlands," explains Bacha. At present there are just four wetlands under the control of the state wildlife department. But there are several wetlands across Kashmir, which remain largely unmanaged. As a result, people have encroached upon them. But even the water bodies under the wildlife department are not free from encroachment and poaching. This has often brought the local people and wildlife authorities on a collision course. Some of the problems are the result of management inputs gone wrong. For instance, in Haigam wetland, a cross bund (embankment) was constructed in the early eighties, which bisected the wetland and cut off a huge chunk of land. It is used by people as a pathway. The cut off land is used to cultivate paddy. Though authorities are in the process of retrieving this land, they claim that political pressure is the main reason preventing the department from taking stringent action against the encroachers. "The bund has become a lifeline for the farmers. If we remove it, the farmers will rise against us and there will be law and order problem. We shall have to devise a strategy so that all goes well," adds Bacha. At Hokara wetland, the problem is more complex. The wetland is facing massive siltation. The government has diverted the Dood Ganga stream, which was feeding water to the wetland. Another feeding channel, Suzaat Nallah has become deeper than the wetland. Thus the water from this channel gets blocked and does not flow out. "We have asked the irrigation department to correct this. We are in the process of bringing back the glory of this wetland," assures Bacha.